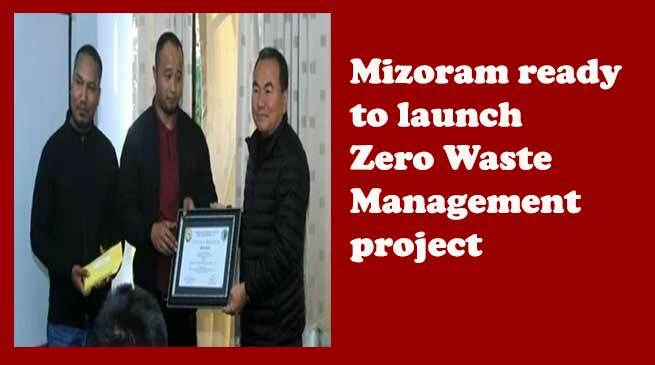 Mizoram is ready to launch Zero Waste Management project under the New Economic Development Policy (NEDP) to be the first in the history of the state. The work order for the project worth Rs 15 lakh was handed over by Urban and Poverty Alleviation minister Zodintluanga to four institutions. The main objective of the project is recycling of waste, waste disposal and management, Zodintluanga said. “Though Zero waste concept is very new to the Mizos, the project has to be launched in the state for cleaner environment,” he said. He said that the project will be launched in four institutions- Pachhunga University College (PUC), Aizawl Theological College (ATC), Academy of Integrated Christian Studies (AICS) and Higher and Technical Institute of Mizoram (HATIM). “Special preference was given to these institutions as they are equipped with good compound where they disposed wastes. They are expected to carry out better waste management within their respective campus and this project does not aim to give financial profit to any individual and group,” he added. Under this project, manure would be processed out of green waste through the process of composting, recycles waste and dispose inert materials, the minister also said. He added that Zero Waste Management initiative is for the well being of the people and the four institutions will set an example in maintaining clean environment for the people. UD&PA secretary Dr C Vanlalramsanga, who spoke on the occasion also lauded the minister for taking effort to launch Zero Waste Management in the state. The department is excited to implement the project which also aims at reducing consumers products, he added. Zodintluanga also on Wednesday handed over prizes to six localities of Aizawl which won best street decoration competition during festive season. Tlangnuam locality which bagged the first prize was awarded with Rs. 1 lakh, while Chaltlang was given Rs. 70,000 for winning the second prize. Durtlang locality won the third prize and was awarded Rs 50,000. Apart from these, Rs. 20,000 each was given to Mission Veng, Republic Vengthlang and Electric Veng as consolation prizes.